You can never go wrong with Classic Eggs Benedict! This poached egg recipe with a spicy twist is sure to join your brunch menu standouts. Eggs Benedict remains a classic breakfast and brunch offering, but continues to increase in menu penetration (up by 19% over the past 4 years). White vinegar --- 2 tsp. English muffins --- 4 ea. TABASCO® brand Original Red Sauce --- 1 tsp. Egg yolks, large --- 2 ea. Lemon juice, freshly squeezed --- 1 Tbsp. For the Hollandaise sauce, whisk egg yolks with water and salt in a medium-size glass or stainless steel bowl. Place bowl over (but not in) a large saucepan of simmering water and whisk until warm. Slowly add melted butter, one tablespoon at a time, whisking constantly until butter is incorporated. Continue whisking until all butter is incorporated and sauce is thickened. Whisk in lemon juice and TABASCO® Sauce. Keep warm. Cook bacon in a non-stick skillet over medium-high heat until lightly browned, about 1 minute per side. Set aside. Fill non-stick skillet with water, about 3/4 full; add vinegar. Bring to a boil; reduce heat to low. Break eggs, one at a time into a saucer; slide each egg into simmering water, no more than 4 at a time. Cook 3 minutes or until eggs are set. Eggs are done when whites become opaque and yolks lose their shine. Repeat with remaining eggs. While eggs are cooking, split and toast the English muffins. Once toasted, butter lightly. Remove eggs with a slotted spoon and set aside on a paper towel-lined plate until you are ready to assemble. To assemble, place two English muffin halves on a plate. 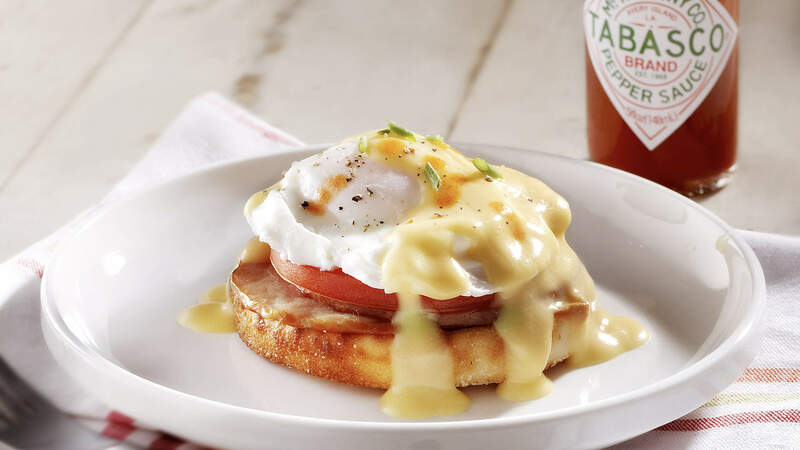 Top each half with a slice of Canadian bacon, a slice of tomato and a poached egg. Pour Hollandaise over the top and serve immediately.